Our new Yeti harness now comes in 2 versions: the Yeti ultralight version shown here with opening buckles, or the Xtrem version, a minimalist step-in harness without buckles. Compared to the lightest ultralight harnesses on the market, the Yeti offers an excellent ratio of comfort to weight and improved durability. The Yeti is ideal for hike 'n fly, para-alpinism, speedflying, travel, soaring or simply to keep in your car for whenever you get the opportunity to steal a quick flight! 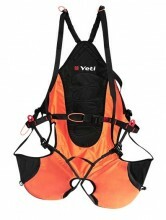 The Yeti is part of a versatile system that covers all your lightweight needs. For greater protection, simply add the optional airbag and Yeti rescue with front container. To carry your equipment, you can choose from a wide range of technical rucksacks, or alternatively, the Yeti convertible harness/rucksack. Finally, add a Yeti paraglider and you're good to go! Click the button below to add the Gin Yeti to your wish list.